This section reviews my results from DNA test conducted by Ancestry DNA. The Ancestry site test autosomal DNA (see introduction to this DNA section for background information on this test) which can be used to identify people with DNA matching yours (common parental and or maternal ancestors) back to your 3 X Great Grandparents and sometimes for several generations beyond that. The Ancestry site also allows you to search their database for DNA matches with other people who have tested their autosomal DNA with them. The closest matches with Newell connections were a first cousin once removed and several 3rd cousins who are descendants of Newells from ‘The Dock’ (through my 2X great uncles). I did not find any Newell first cousins which is not surprising since, to the best of my knowledge, none did the test. I have seven second cousin matches, most of which link to my maternal side. The search also found 80+ 3rd cousin matches but only a quarter of these posted any significant family history (searchable names). My mother’s Snelgrove ancestors (her mother was Jessie Snelgrove from Bears’s Cove, Harbour Grace) represented the majority of the matches and had the had the most complete family trees. The higher proportion of matches from this family is partially due to the size of the family but most significantly can be trace back to the efforts of one person, Ethel Knight of Milwaukee, USA, who visited Newfoundland in the 1960s and did research on the Snelgrove family tree. 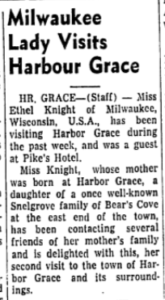 I was a kid but can remember her visiting my Aunts (see following from St. John’s Daily News, Aug 28, 1963). What this demonstrate is that the potential for finding DNA matches from any set of ancestors will depend not only on reproductive success (number of surviving children) but also on a history of genealogical research in that family. One of the advantages of DNA is that it provides the possibility of identifying links to early Newells (not in my tree) or Newells from outside ‘The Dock’. In this regard 4th and 5th cousin matches are the most interesting since these are cases where I share a 3X or 4X grandparent with the match. On the Newell side my 3X great grandparents are Philip and Amy who are my earliest documented Newell ancestors. However, once we move into the area of 4th cousin matches the issues become more complicated. Everyone has 32 3X grandparents and in most cases only one of these was born with the family name (DNA). Calculating the number of descendants from each of the 16 sets of 3X grandparents is not a simple process but with a few assumptions (e.g. 3 surviving children per couple) it is is possible to estimate that after 6 generations my 16 pairs of 3X grandparents could potentially have 1000 descendants per couple (total of 16,000). It is, therefore, not surprising that Ancestry identified almost 1000 4th and 5th cousin DNA matches with me; however, the vast majority of these will not carry the Newell DNA. To assist with sorting matches I have prepared a shared Spreadsheet (to view right click link and select open in new Tab) to show my ancestors by family name for each generation. For example, the Spreadsheet shows that my parents are John Newell and Gladys Norman and their parents, my grand parents, are Albert Newell and Clara Andrews on the paternal side and Thomas Norman and Jessie Snelgrove on the maternal side. The row at the bottom shows the number of direct ancestors in each generation versus the number of these where I know their family name. I know the family names of all my great grandparents but only 12 of my 16 2X grandparents and 17 of my 32 3X grandparents. The largest gap relates to the ancestors of my great grandparents Abraham Norman and his wife Harriett. What this means is that potentially I might only know the family name of the common ancestors for half of my 4th cousins. In addition, the relationship between myself and someone with matching DNA may be more distant than my ancestor suggests. For example, I found a number of 4th cousin matches for people with the Andrews, Wells and Dawe in their trees (my grandmother was Clara Andrews from Port de Grave , my great grandmother was Caroline Wells from Salmon Cove and my 2X grandmother was Frances Dawe / Daw of Port-de-Grave). The fact that these were 4th cousin matches and not 1st, 2nd or 3rd cousin matches indicates that the common ancestor for these matches was one or more generations earlier (e.g. someone descended from a uncle or aunt of one of these people). The remainder of this document focuses on using my Ancestry DNA results to research my Newell ancestors; however, I have prepared several other documents that focus on other aspects of my DNA research (see screenshot of Web Page sub directories below). and my research into William Freeman and his connections to my family. When I searched my Ancestry DNA matches for people with the Newell name in their tree I found 128 4th and 5th cousin matches (this number will change over time) including several that have links to ‘The Dock’ and others with links to other communities in Newfoundland. The earliest match to a Newell from ‘The Dock’ was a 4th cousin match who is descended from James son of Philip. There were several matches to people with Newell ancestors from Clarke’s Beach, situated near ‘The Dock’, and this is not unexpected since some Newells from ‘The Dock’ moved there. There were also several links to people from Burnt Head situated on the opposite side of Bay-de-Grave from ‘The Dock’. There include a link to an Ann Newell (b. 1819) who married a Morgan at Burnt Head, but no indication that she was a Newell from Burnt Head (she could have been a Newell from ‘The Dock’). a possible but not confirmed link to Agnes Noel (b 1866) of Brigus, daughter of John Noal b 1837. The published trees for many of the above link back to John Noel of Brigus born 1790s or his father; however, these links to John Noel may simply reflect assumptions based on the fact that he was the earliest documented Noel/Newell in Brigus. There is the possibility that my DNA links to Newells from Brigus come from my other Newfoundland ancestors (e.g. Norman, Wells, Daw, etc.) that have links to Brigus. The missing ancestors for my great grandfather Abraham Norman may play an important role here since I suspect that they were from Brigus. The Normans were among the earliest settlers in Brigus and intermarried with other Brigus families such as Antle, Bartlett and Noel. Comparing my Brigus DNA links to results for two of my 3rd cousins, descended from brothers of my great grandfather, suggest that we have several of these Brigus matches in common especially for links tracing back to James Henry Noall/Newell of Brigus. There were several links to Newells from Pouch Cove but nothing definitive enough to prove a connection between the Newells of Pouch Cove and ‘The Dock’. Interestingly, the links to Pouch Cove are at the 4th cousin level (only one at 5th who was clearly further removed) suggesting the link might be through a common ancestor who was living in the late 1700s. It is also interesting that I get links to Thornes of Pouch Cove (see below). There were also a number of 4th and 5th cousin links to Newells from St. John’s (not Pouch Cove) including a Margaret Newell (c.1790-1888) who married Richard Stanley Cross. Margaret was the daughter of Nicholas Newell and Frances Mugford who have been linked to the Pouch Cove Newells . Based on the matches and her date of birth I initially suspected that Margaret might be a a daughter of Philip; however, after further research on the ancestors of the matches I now suspect that the DNA connection is through their Crummey ancestors of Western Bay who are likely the same family as my Comby / Cumby ancestors. The largest set of 4th and 5th cousin Newell matches are with individuals with links to the Newells of Trinity. The bulk of these matches were at the 5th cousin level (more on 5th cousin matches in a subsequent section) and the 4th cousin matches might reflect cases with multiple DNA connections (Trinity Newell plus another ). The Ancestry test may also have provided evidence for a theory first presented to me by Harold Newell in 1971. Harold noted that on the same day when Philip Noel (Newell) married Amy Batton at St. Pauls’ Church, Harbour Grace, Nfld. in November 1784 a William Button (Batton) married a Mary Noel. Harold suggested that it was a case of siblings marrying siblings in double marriage ; however, there was no hard evidence for this (see my discussion of ‘The Early Newells‘ under ‘The Dock’ Tab on this site). The Ancestry DNA test may have found evidence for this. I had a 3rd or 4th cousin match (Confidence: Extremely High) with a person that traces back to a Isaac Batten of ‘The Dock’ born c 1869 (see my research into non Newell Ancestors). There were several several 4th/5th cousin matches that related to families not in my tree but who could be candidates for missing gg or ggg grandparents. These include several local families like French (links to Batten) and Mugford (poss Newell, Batten & French links). One name that was unexpected was Thorne which had several distant DNA matches to the Thorns of Torbay and New Harbour, Trinity Bay. Both of these families trace roots back to John Thorne, an agent for Trinity merchant Benjamin Lester. Thorne was established in New Harbour, Trinity Bay by the 1770s. There is some Newell family history that suggests a connection to the Newells of Trinity but not those of Bonavista. The Thorns of Harbour Grace were merchants that had strong connections with several families in ‘The Dock’ including building the schooner Thorne in Bareneed c 1818. In addition, my family had business connections to the Nuttall family (of Harbour Grace and Brigus) who were related to the Thornes (see Merchant Connections). One totally unexpected connection was an apparent link to John Neville who was married at St. John’s (RC church) in 1805. A 3rd cousin (related to Nathaniel Newell of the Dock) also found this link which suggest it predates our common gg grandfather (John son of Philip). John Nevil (later Neville) was from Co. Wexford, Ireland. The early Nevilles of Wexford were a Norman family that is frequently referenced as Newell in early (per 1700) English documents (I have researched the Irish Newells and plan to do a section on them in future). However, the DNA connection might also be through his wife Anne Corbit who may be related to the Corban (Corbett/Corbit/Corbet/Corbin) family of ‘The Dock’ (Bartholomew Corban was settled there in the 1770s); I also get several 5th cousin DNA matches to this family. One set of non Newell connections that is especially interesting are a number of 3rd, 4th to 5th cousin matches to Noels from Harbour Grace. Peter Noel, who has done considerable research on the Noels of Harbour Grace, has speculated about a connection between the two families. Peter and I did Y-DNA test (more on this in Y-DNA report) that suggest a possible distant connection that would likely be well beyond the 5th cousin level (I am not sure if he did the Ancestry autosomal test but I think he did a similar test with Family tree). After further research, I suspect that my autosomal DNA links to Noels may come through my mother’s ancestors who were Snelgroves and Cakes from the Harbour Grace area who intermarried with several Noels from this area or from the ancestors of my grandmother Clara Andrews. Other names with possible Y-DNA connection (see Y-DNA Section) that produce a significant number 5th+ cousin level (possible distant link) are Clark/Clarke and Cheek. These names are not in my tree so this could reflect a distant link or just genetic noise (see next paragraph). The Y-DNA Clark connection links back to Dorset/Devon where many of my ancestors have their roots. The Cheek Y-DNA connection links back to the early colonial period in the Southeast USA. One factor that confuses autosomal results for people with roots in Conception Bay North is that there were a limited number of families that settled in this area during the 18th century and not a lot of subsequent in-migration. As a result many people with deep roots in the Dock will share some DNA ( around the 5th cousin level) with almost everyone else. This occurs since any person will have 32 ggg-grandparents and this is close to the number of family names in the Dock (and neighboring communities) during the 18th century so the probability of any two two people with deep roots in the Dock sharing some DNA is high. My paper on Conception Bay South investigates some of these connections. I have prepared a shared Spreadsheet that compares the number of matches by location for the four main names (to view right click link and select open in new Tab). The Spreadsheet shows that Newell had the most distant cousin matches that met the criteria outlined above and Neville the lowest but this is somewhat misleading. Some names had significantly more matches from Newfoundland than others. 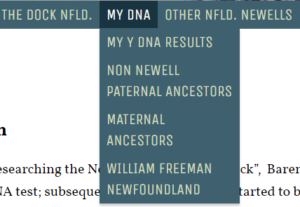 This is significant since a 5th cousin match from Newfoundland might not represent a 5th cousin but a 4th cousin once or twice removed; in addition, it might represent a link to one of my non Newell ancestors from Newfoundland (many predate the Newells in Newfoundland). In this case we might be detecting descendants of Philip or perhaps other Newfoundland descendants of Philip’s parents (James and Ann?) or other non Newell ancestors. The Noel 5th cousin matches stand out with the highest proportion of earliest ancestors being from Newfoundland. Further, most of these listed Carbonear or Harbour Grace as the earliest known ancestral home and many identified Clement Noel as their ancestor. This large number of distant DNA matches might be considered as supporting the theory that the Newells of ‘The Dock’ were really Harbour Grace Noels; however, the problem is that my mothers ancestors (Snelgrove, Cake, Herald and Smith) were all from the same area as the Noels and many intermarried with the Noels (evidence from 2nd, 3rd & 4th cousin matches). This makes it impossible to separate out these matches; further, selective searches on many Noel 5th cousin matches show shared matches with these non Noel individuals in my tree. Likewise my matches to Noels of Grates Cove and Brigus (AKA Newell) can be explained by other connections. My Y-DNA (separate test discussed later in this document) suggest a possible distant (not in range of the Ancestry test) connection to the Noels of Harbour Grace (Peter Noel); however, my DNA link to the distant Ancestry matches likely did not come from my direct paternal ancestor. Many of the Neville distant DNA matches are from St. John’s and appear to be connected to 4th cousin matches to John Neville, birth c.1776, Wexford, Ireland who married Anne Colbert at St John’s, Newfoundland in 1805. As I indicated earlier this DNA connection may be through his wife. It should also be noted that Philip Corbett (AKA Corbin) of Bareneed was part owner of the schooner Thorne which was built in Bareneed (see my web page on Merchant Connections). However, one other link to a Thomas Neville of North River (near the Dock) raises the possibility of a connection with the North River Nevilles. The Newell matches to Newfoundland have peaks associated with Brigus, St. John’s and Trinity. The Brigus connection to Newell and Noel may come from my mothers family. Her father was a Norman from Bay Roberts but his family roots were likely in Brigus. I get lots of matches to early Brigus families like Antles, Bartletts and Noel. The St. John’s connections may come from a sibling, child or grandchild of Philip who moved to St. John’s or from another connection like Neville or Thorne. The Trinity connection is the most interesting since my father suggested that there might be a family connection to the Newells of Trinity, Nfld. but not to those of Bonavista. If you trace back the links they all connect to children of Jonah Newell 1728 – 1799 and his wife Hannah Mears 1736 – 1788 of Trinity (I get a number of distant DNA matches to people with the Mears name). My DNA matches also include a significant number of matches to other family names associated with Trinity and the Newell family including: Thorne, Oldford, Fifield, Abbott, Jones and Newhook. The issue with these matches to Jonah Newell is that, despite in-depth research on the Newells of Trinity, it is difficult to make a connection. Jonah had a son James who died young and there is no evidence he is the link. My father indicated that we had some connection to the Newhooks of Trinity Bay and the DNA show a connection to Charles and Catherine Newhook from New Harbour, Trinity Bay. Catherine was a daughter of Jonah so this is just another connection back to Jonah. The Newhooks were famous shipbuilders in Trinity Bay and the DNA connection back to John Thorne of Trinity may be connected in some way since, as indicated earlier, a schooner Thorne was built at Bareneed c 1818. My DNA connections, regardless of family name, include people connected with many towns in Trinity Bay (see shared Spreadsheet). These connections are strongest at the 4th and 5th cousin level suggesting a links with one or more of my ggg grandparents or possibly earlier. It should be noted that many of the communities listed were originally settled by people from Trinity. Some of my DNA connections to Grate’s Cove and Old Perlican may have come from my mothers side (Snelgrove, her grandfather’s family) via a direct or indirect (through Benson or Smith) link to the ancestors of Daniel Noel/Newell of Grate’s Cove. This link or the links to the Newells of Trinity might also explain some of the early DNA links to Newells of St. John’s. The objective of this analysis was to identify possible family origins in the UK; however, the Newell distant DNA matches do not have a clear signature in the UK or Ireland. There were a limited number of matches compared to those for New England and Nova Scotia and apart from a peak in Lancashire they were scattered across the UK. It is interesting that Knowles also has a peak in Lancashire and overall for all 4 names there is a higher frequency of matches for these four names from the North of England & Scotland than from the south of England (even more significant when adjusted for population). My Y-DNA results (discussed later in this document) that focus on paternal DNA also suggest a stronger connection to the north of England and south Scotland than to the south of England (note: this only applies to my Newell ancestors since many of my other ancestors roots trace back to Devon and Dorset). If we focus on non Newfoundland matches then Knowles has the highest number (52) followed by Newell (41), Neville (30) and Noel (17). Drilling down further both Newell and Knowles had more than half of the non Nfld. matches from New England plus Nova Scotia while Noel and Neville had none from these areas! Noel and especially Neville had a high proportion of non Nfld. matches that trace their roots back to early colonial Virginia and surrounding states (note connection to Cheek distant Y-DNA matches discussed earlier). Noel also had several matches with connections to Quebec. Knowles has the most interesting pattern of North American (excluding Nfld.) matches. The Knowles matches are focused on Chatham, Barnstaple, Massachusetts (located at the “elbow” of Cape Cod, Chatham was a shipping, fishing and whaling center) and Shelburne, Nova Scotia. This is not a random connection since the area around Shelburne was settled in the 1760s by families from Barnstaple and Nantucket, Mass. (see: A History of Barrington township and vicinity, Shelburne County, Nova Scotia, 1604-1870). The book “The Knowles Family of Eastham, Mass.” by C.T. Libby states that a: Richard Knowleswas first located on the New England records of Plymouth, Massachusetts in January of 1638. He married Ruth Bower on 15 August 1639 and they later settled in Eastham, Massachusetts (Near Barnstaple). Other sources suggest that Richard was possibly from Lancashire, England. The family names of the settlers that moved to Shelburne County, Nova Scotia in the 1760s included: Knowles, Smith, Paine, Snow, Hopkins, Crowell, Freeman and Harding . Another name that is frequently associated with the Knowles DNA matches is Smith. The Smiths were another family from Barnstaple Mass. and intermarried with the Knowles in Nova Scotia. Thankful Knowles married David Smith and they are the ancestors of several Nova Scotia DNA matches. The links to Knowles, while centered on the Barnstaple and Shelbourne areas, extends to other Knowles throughout New England and Nova Scotia. In addition, I also get significant numbers of DNA matches to other families linked to the Knowles of Barnstaple and Shelbourne (e.g. Freeman, Doane, Paine, Snow, Folger, Nickerson, Coffin, Harding and Smith). Smith and Snow are both in my Newfoundland tree so I get both sets of matches for them. The link to these other families is that they share a common heritage with the Knowles over 6-7 generations and in many cases intermarrying with them several times over different generations and as a result they share common DNA. While the case for a direct link to Knowles is strong there is the possibility that this DNA link comes indirectly through non Knowles families in my tree. One interesting possibility is that there might be a Newell connection in Nova Scotia or Massachusetts. A large number of Newells from ‘The Dock’, including my grandparents, moved to Cape Breton, NS and Massachusetts in the mid to late 1800s. However, these Newells would be 2nd, 3rd or possibly 4th cousins plus the diversity of connections to the Knowles (spread over large geographic area and different families) makes this unlikely. One especially interesting connection is that one of my great aunts (Albert’s sister) married a Smith from Nova Scotia (they likely met in Mass.) and this family of Smiths trace their roots to the Knowles who moved to Nova Scotia from Barnstaple, Mass. ; however, this connection would be at the 2nd cousin level. There are five 5th cousin links to Newells of Nova Scotia. In four of these cases the common ancestor is Henry Newell born 1755 in Boston who married a Smith from Chatham, Barnstaple, Mass. [home of Knowles] and subsequently moved to Nova Scotia; in the remaining case a later Newell b 1819 in the same town as the others (poss relative) married a Nickerson (name linked to Knowles). The tree for one of these matches traces Henry back to Newhalls of Lynn, Mass; an area where many of the Newells from the Dock moved to in the 1800s. However, this tree includes many family names associated with Knowles & Barnstaple so it is possible Henry was a Knowle. The remaining option is a connection through one of my non Newell ancestors. Perhaps my Smith or Snow ancestors from Newfoundland are related to the Smiths and Snows from Massachusetts; however, both of these families have deep roots in Newfoundland and there is no suggestion of links to New England (still possible). I recently investigated the possibility of a link through the Freeman family of St. John’s (William Sr. b c. 1755 and Jr. b 1785). The Freeman name is very closely tied to the Knowles of Barnstaple, Mass. and Nova Scotia and William Freeman Junior is connected to several of my non Newell ancestral families in the Port de Grave area (e.g. Batten and Andrews). In addition, William Senior and Junior have possible connections to the Newells of St. John’s. See my Ancestry tree for William Freeman and my Web Page on William Freeman for more information. Despite numerous DNA links to the Freeman name I was not able to identify a DNA link to William Freeman of St. John’s. There were possible DNA connections to the Freeman families of Salmon Cove (now Champney’s West) , Trinity Bay and Twillingate; however, I could not find a connection between these families and William Freeman of St. John’s. One way to isolate the Knowles connection is to compare my results with those for other Newell relatives. A 3rd cousin once removed had 6 matches to Knowles, all 5-8th cousins, all Great Britain as main ethnicity, ties to Massachusettes and a 3rd cousin had two 4th cousins and over 70 in the distant cousin category that linked to Knowles. The rapid drop off between a 3rd cousin and a 3rd once removed is not surprising since distant cousins are near the edge of detection. This does support the conclusion that the connection to Knowles is real and is since these 3rd cousins predate my Andrews ancestors it rules this out as a primary cause of my matches; however, a Andrews connection might be amplifying my DNA link to Knowles. The one other feature provided by the Ancestry DNA autosomal test is determining the geographic origin of your ancestors; however, while this feature is frequently cited in their advertisements it needs to be put into context. This type of estimate is possible since in pre-industrial societies people generally married within their cultural/ethnic/geographic groups. Due to the mixing of DNA with each generation certain autosomal genetic markers spread through the population so for example people from Germany have different markers than those from Italy. The DNA clusters (on left) are associated with different countries (see codes on right). 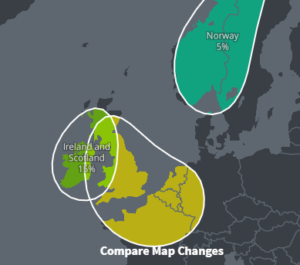 My original (see newer results in update below) Ancestry DNA autosomal test identified me as 41% Scandinavian, 31% Celtic (Ireland, Scotland and Wales) and 15% British (Anglo Saxon). My Newell relatives should note that the autosomal results include DNA from my mothers side (e.g. Norman and Snelgrove families) plus my fathers mother’s family (Andrews etc.) and all other earlier non Newell ancestors so their country of origin autosomal results will differ from these since their non Newell ancestors will differ from mine. Several years ago I did the National Geographic autosomal DNA test which used a slightly different methodology to identify the geographic origins of my ancestors. This test identified my closest matching region as Denmark which agrees with the Ancestry results since Denmark is part of the Ancestry DNA Scandinavian region. However, National Geographic identified my second matching region as Germany (National Geographic only gives two regions). This second region is different from the Ancestry results which indicated Celtic (31%) and UK Anglo Saxion (15%); however, this difference can be explained by differences in methodology. Some countries have relatively unique DNA signatures (e.g. Poland and Italy); while others overlap. DNA signatures for the UK, the Netherlands and Northern Germany are relatively similar. The UK and Ireland have some genetic components that are unique and some that are shared with their Northwest European neighbors. This pattern of DNA for the UK reflects the different groups of people (Ancient Britons, Celtic, Anglo-Saxon, Danish, Viking, Norman French, etc) that make up the population of the UK (See: http://www.telegraph.co.uk/science/2016/03/14/britons-still-live-in-anglo-saxon-tribal-kingdoms-oxford-univers/ ). DNA from northwest Europe (Germany, Denmark and Belgium) can account for over 40% of the DNA in parts of the UK. Ireland has a slightly less varied DNA profile with a larger Celtic component, a Scandinavian component from the Vikings and later (post 1500) DNA from the UK. 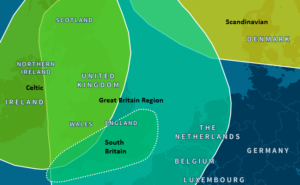 It should also be noted that the Ancestry region for Britain includes Normandy, Belgium, the Netherlands and the NW Rhine in Germany (see Map below) and these areas overlap with the National Geographic German region. Therefore, the differences between the two test likely reflect the differences in methodology for selecting regions. Within the Great Britain region Ancestry identified a focus on the south coast of Britain. This is not surprising since many of my ancestors trace their roots back to Dorset, Devon and the Channel Islands. Ancestry also identified links between my ancestors and New England and Nova Scotia and states that Nova Scotia & Massachusetts are “specific places in this region where your family might have lived“. This latter remark is especially interesting given the earlier analysis of my 5th cousin Newell and Knowles matches. As part of the new process Ancestry revised their regions and the one that I now have a 80% match with is called England, Wales and Northwestern Europe. My match to this region increased from 15% in the initial results; however, this region now includes more of northwestern Germany and northern France (including the French / German border along the Rhine). This provides an even better match to the regions covered by my National Geographic DNA results.